What are they teaching kids in school these days? Would you believe me if I told you they might be learning about social awareness and how to give back to the community? It’s true! The Youth and Philanthropy Initiative, or YPI, has been part of the high school curriculum (usually grade ten) here in Canada for a number of years now, and is also taught in the UK and the US. Here’s how it works. Students work together in groups to find out the diverse social needs of their community and then select a social need that they are passionate about. They research local, grassroots, social providers whose aim is to help members of the community faced with that specific need, and then pick one charity they feel is having a positive impact on the community. Once the research is complete, groups do a short presentation on their charity and how a grant would help it better serve its clients. A group from each class is chosen to conduct a final presentation in front of their entire school and a judging panel, most of whom are fellow students. Finally, the team with the most compelling presentation wins a $5,000 grant which is awarded directly to the chosen charity. So each term we get a few groups of students calling and wanting to find out what we do at RainCity Housing. And every time it’s a new experience for me and I never grow tired of it, as each group has different ideas and ways of expressing them. Some want to interview our staff on video, some want to visit our different sites, but all of these amazing students are genuinely curious about how we can end homelessness and what can be actually done. When I was 15, I hadn’t even heard of the term homelessness, let alone want to do something about it. Still, they thanked me once more, and invited me to their school to watch their presentation to the rest of the school staff. 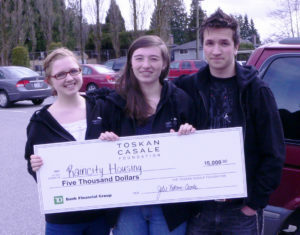 Alina, Allie and Mathew from Cariboo Secondary School, Burnaby, BC with review of cialis daily their $5000 cheque! Sadly, not every group of students will be able to win $5000 for their chosen charity. But we’re all the wealthier for it because of the change that can take place. Because real change takes place when people of any age start to find out what role they can play in dispelling myths, learning about homelessness (in this instance), and sharing that information with family and friends. How will you create change?